We're starting September off with a good challenge for all you artists out there who like to create a little outside your comfort zones. Of course, you can still join in on the challenge with Anything Goes and we welcome all comers, hence our challenge name Art With No Boundaries. However, don't you just every once in a while like to explore something new to you or something you haven't created for a long time. The Bonus Round for our challenge this time around is Such A Doll, be sure to create a doll with moving parts and not just images of paper dolls and if you enter the Bonus Round put BR after you name. I for one have never made an Art Doll before the one you see above. I was totally exploring a new medium when I created this Snow Sprite. Chris at CS Designs has some new kits and digi collections going up at the store this week. Art Dolls included. 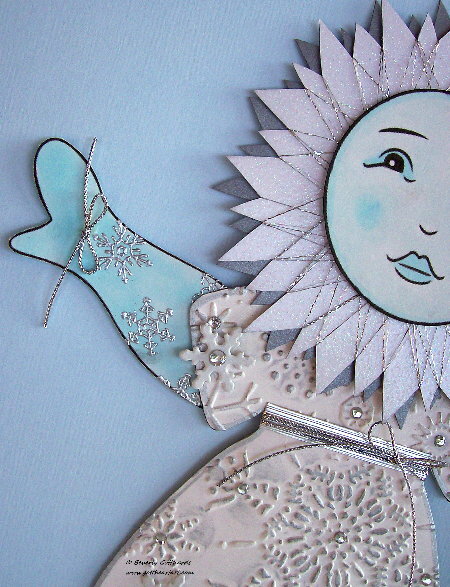 You can be so creative with these art dolls. I'd really like for you to click over and see what the rest of the team has come up with. You'll be very inspired. 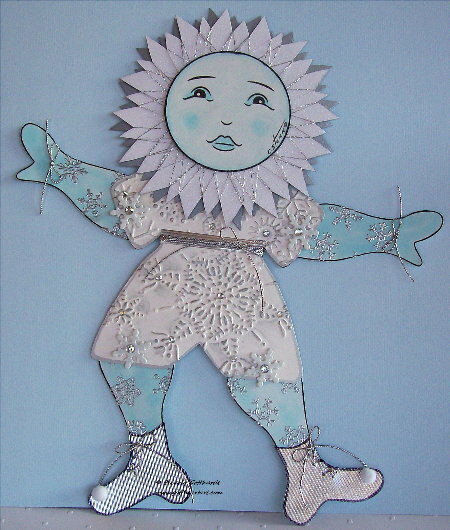 I used the Funky Art Doll, and to frame her head with an icy snowflake I used the Solar Flare pattern from the Spirelli kit which I cut out of white glitter paper and wrapped with silver filament thread then cut one from silver card stock to off set behind that one but didn't wrap. I used white card stock for the body, face, arms, and legs. I colored the face with Copic markers. The body I dry embossed and hit the highlights with silver metallic rub on. I heat embossed the arms and legs with silver snowflakes then colored with Copic markers. I cut a pair of boots out of silver ridged card stock and carefully laced them with silver cord, edged them with Black Sharpie marker, attached them to the leg and added the white pom poms. I attached a piece of the ridged silver card stock and some silver cord for the sash and silver cord at the wrists. To finish assembling the doll I attached the arms and legs with snowflake brads and added tiny rhinestones to the brads and randomly on the body. After making this doll I have some more ideas so this won't be the last Art Doll you see here on my blog. That means even after the one you will see next week for the second half of our challenge. I'm hoping to see lots of my followers enter in on this challenge in the bonus round because I know there are a lot of you who like to stretch you wings and can come up with some really interesting dolls for our viewing pleasure. We're welcoming a Guest Designer this month: Wendy from Wendy P's Little Corner of the World she's created an art doll and added her to an art journal. Be sure to give Wendy and the rest of the team some great comments on their very clever projects. You have created an extraordinary art doll...so amazing that it's your first. You are a natural. Her details and texture are stunning. Love those boots with the laces and pompoms. Just delightful, Beverly! 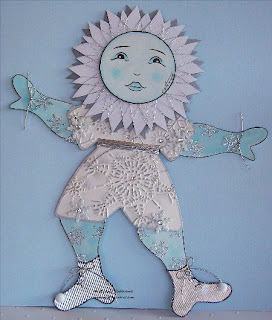 Love her embossed and raised snowflakes and those snow boots are adorable with the pom poms! Just adorable! Ohhh i love this doll! 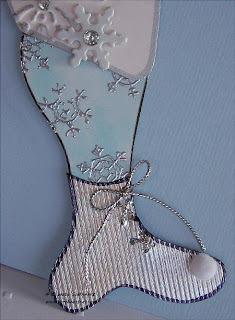 Love the soft colors, such a winter princess!